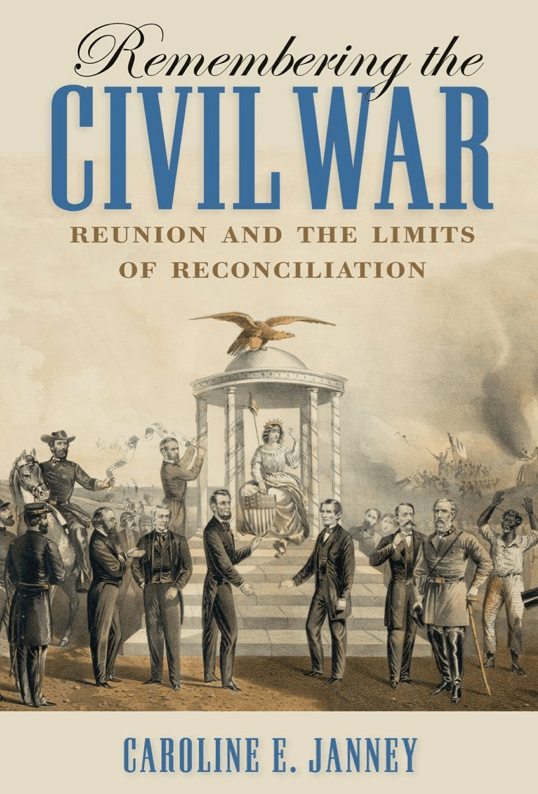 Caroline Janney’s new book, Remembering the Civil War: Reunion and the Limits of Reconciliation (University of North Carolina Press, 2013) arrived this past Saturday. You should be able to pick it up in a few weeks. I usually wait until I have four or five new books before listing them, but given the focus of this book I wanted to single it out. This title is the latest release in the Littlefield History of the Civil War Era, which is edited by Gary Gallagher and T. Michael Parrish. I’ve been looking forward to it for a couple of years now. The few times I was able to talk shop with Carrie definitely helped as I was researching my own book as did a number of her journal articles published along the way. It should come as no surprise that I’ve pushed practically everything aside to make room for this one. Remembering the Civil War promises to be the most comprehensive treatment of Civil War memory since the publication of Blight’s Race and Reunion: The Civil War in American Memory back in 2002. At the same time Carrie has set out to refocus scholars on a number of interpretive points that she and a small, but growing number of scholars have emphasized in recent years. Without saying so explicitly, Carrie is commenting on the influence that Blight’s thesis has had over the past ten years on both scholars and the broader public. It’s as well argued a thesis as you will find, but it is also a comforting framework in a nation that has attempted to come to terms with its collective moral responsibility for its past. I suspect that it is rare for a scholarly work such as Blight’s to enjoy such a popular reception beyond the halls of academe. Much of what I’ve written on this blog and for publication, including my book, has been influenced heavily by Race and Reunion. Whether Carrie can chip away at this has yet to be seen, but for now that doesn’t matter much to me. I am looking forward to spending many more hours with the work of a top-notch scholar and friend. I really look forward to reading this book. I’m curious to see how she accounts for the fact that at least in the federal courts–the U.S. Supreme Court in particular–there was pretty much a long period of capitulation to the former Confederate States’ program of disfranchisment and degraded status for former slaves. There are a few instances in which the capitulation was not uniform, or incomplete, but not enough to make a lasting or widespread difference for African Americans living in the former Confederacy until the tide slowly started to turn in about the late 1930s and picked up meaningful speed in 1944. I looked through the index, but it doesn’t look like Carrie deals much with the Supreme Court.